One of the most sought after streets in Westport is home to the latest offering from multiple award winning builder; CCO Habitats. Enjoy living in a true neighborhood, as well as strolling to town for fine dining and shopping, concerts at the Levitt Pavilion, listening to a lecture at the library, or even fishing for blues in the Saugatuck River. This sleek new construction home is finished on four levels with the style and variety characteristic of this builder's motto that every home should be unique. 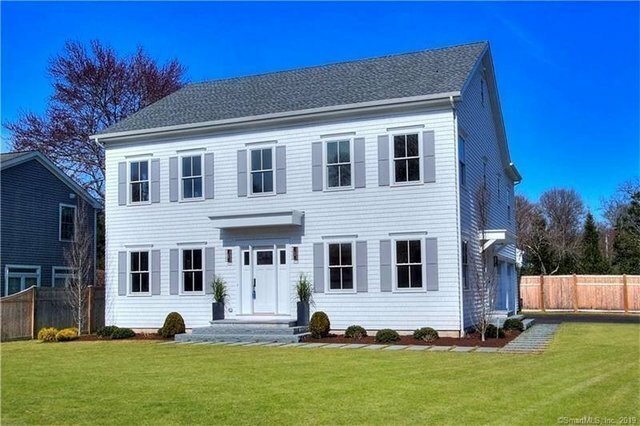 As always, trying to stay in keeping with the surrounding neighborhood, this thoughtfully designed transitional colonial has more of a traditional exterior that makes the sophisticated interior a lovely twist. The positioning on the corner lot makes for a light and bright home, with sunshine streaming through oversized doors and windows into the open floorplan and through the stairwell. The front yard incorporates a swath of town land, making the usable lot closer to .4 acre. Even without that, however, there's room for a pool in the flat, dry, fenced back yard. Add natural gas as a heat source to keep down expenses, and this home is sure to check off all the boxes on your wish list. Immediate occupancy possible - come enjoy the good life in your dream "in town" home.